Cubone Helmet How-To Will Up Your Pokémon Game « Adafruit Industries – Makers, hackers, artists, designers and engineers! When I got home, I started bending the wire into shape, using my head as a guide and a mirror as reference. I started with the “footprint” of the skull, or the part that would rest flat against the table if it didn’t have flutes or fangs. 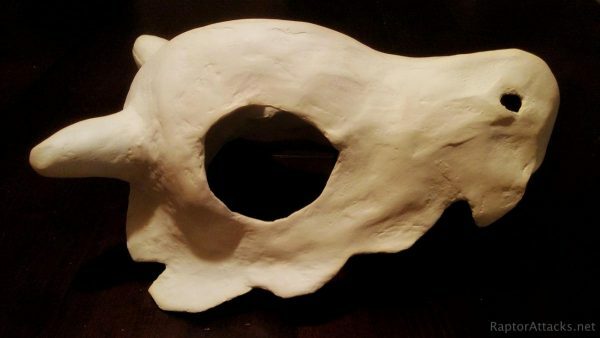 I sized it so that the spherical part of the skull would nestle snugly around my head – leaving just a little room for the paper mache and wood filler that would come later – and made the snout of the skull sized to match, about the size of the bill of a baseball cap. After twisting the ends of wire together to hold their shape (at the very back of the skull, where the bump would be less noticeable), I cut it off and started sculpting a new piece for the “spine” of the skull. 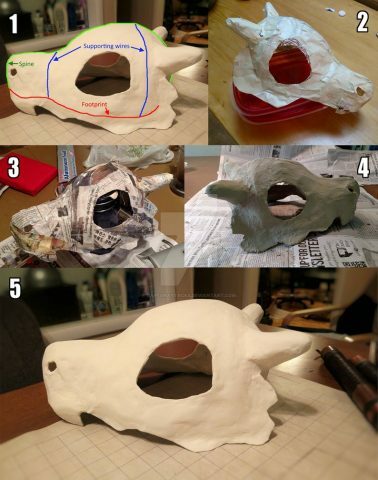 You can see a collage showing off the Cubone helmet progress below. Read the complete tutorial over at Raptor Attacks.